Wouldn’t you know it, dad-at-13 tearaway’s girlfriend is more of a nasty piece of white trash than first appearances would suggest. Frankly, I wouldn’t touch her with yours. After games, movies are probably my greatest passion. I’m lucky that my town has a multiplex and it offers a sort of ‘all you can eat’ service. I pay a fixed amount each month and all ticket costs are covered. The attraction for the cinema is that I’ll be there more often to buy overpriced popcorn and drinks. The attraction for me is that I can easily budget and see heaps of films. Furthermore, any film I’m a bit unsure of might as well be seen as it’s not costing me anything extra to see it. A glance at my timeline widget will show you I get through a lot of movies and, as far as the movies are concerned, I enjoy them a great deal. I find the experience of going to a cinema, the screen, trailers and all that stuff to be very enjoyable. However – is it just me or are audiences the worst thing about cinemas? When I go to see a movie, I go to see a movie. I don’t go to send texts continuously on my phone. Nor do I continue conversations on my phone. I don’t go with a dozen mates who are too immature to handle a passionate scene without falling into a fit of giggles or who, every 10 minutes rush out of the screen en masse, clambering over seats or calling each other only to return moments later with more giggles or waving their mobile phones around. Constantly kicking chairs, making noise or doing anything they can to provoke a reaction seems to be some people’s goal. Poor behaviour isn’t restricted to the youngsters either. Adults on their phones or, amazingly, listening to music through one earpiece or simply chatting to one another or at the movies. The behaviour is rude and inconsiderate and it degrades the experience of every other patron who wants to see the film. Often, it seems, this is the explicit reason for such behaviour in the first place. Yes, I can go out, miss some more of my movie, and call an usher in to observe people being well behaved until they go away again a few minutes later. Unlike many of the people who set out to ruin a movie-going experience, I work for a living. I can’t just choose to see a film on a quiet Tuesday afternoon. I’m also aware that, from a business perspective, I’m one person. If one person is complaining about a group of five people then, purely on numbers, why should the cinema care? I’m only worth a fifth of the revenue. In fact, cinemas don’t seem to care at all. After taking your ticket and popcorn money it’s unlikely they’ll get more cash out of you – yet they’re obliged to house you for a couple of hours. There’s little worth, from their point of view, making those two hours better or worse because they’re not going to earn extra income from it. Sometimes I wonder if they’d rather not show the film at all. So, in spite my 30 or so years being a good cinema patron and in spite of my repeated comments to staff and managers who assure me they’re doing lots to make my experience hassle free (no evidence of this is forthcoming) I’m considering not going to the cinema any more. I can quite easily get the latest releases in good quality and watch them on a 42″ TV at home. I can get my own popcorn and ice-cream (at better prices), I can pause things if I need to answer the phone. Hell, I can even grab trailers if I want. This is a shame, but on increasing instances I’m leaving a cinema feeling that my time has been wasted as I could not enjoy the film or the film-going experience due to the selfishness and poor behaviour of the audience. Is there a solution? I don’t know. Cinema trade seems very healthy and each summer sees more blockbusters than the last. Why should they invest more money or effort into keeping patrons happy when they’re queueing up to see movies anyway? I don’t manage cinemas. I don’t know what their cash-flow is or what their overheads are. What I’d like to see is some positive steps taken to inhibit the functionality of mobile phones in cinema screens. Something that goes a little further than an animated panda telling you not to use your phone. I don’t care if it’s lead lining in the cinema. Or some ultra-high frequency signal that blocks phones from getting to their networks. There’s simply no need to use a phone in a cinema. People seem so concerned that they simply can’t bear to be out of touch with their phone-buddies for two hours that they have to text or natter in a place where communication is expected and intended to be a one-way thing – between screen and viewer. I never have my phone switched on in a cinema. There is simply no reason to have it switched on. Knowing that I can’t expect people to behave with civility or consideration an alternative/additional pipe-dream comes to mind. At the end of the day, I want to hear the film, not other people. If I could plug headphones into my chair and tune into the movie and drown out the popcorn-munching prats around me then I think we’d all be happy. I get my movie experience, selfish idiots can keep texting their equally selfish mates in the adjacent seat. 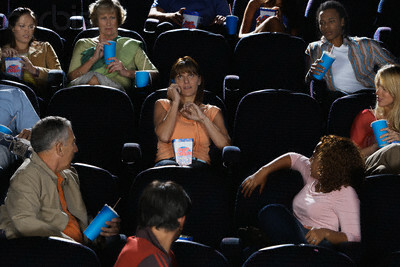 Many cinemas actually have an audio service for the benefit of the hard of hearing or the blind. This would simply be an extension of that service. I’m not sure how workable either idea is, and it’s a shame such a ‘solution’ needs to be sought simply because people are too rude and selfish to abide by some simple considerate rules for a couple of hours. Something I’ve enjoyed doing most of my life is being ruined because the people providing the service don’t care for their customers. So if nothing changes, I’ll simply stop using the cinema as my means of viewing movies. All in all, I don’t think I’m asking for very much – either from the cinema or from the audience. Not to be confused with the execrable “Clue!”, Sleuth is a play revolving around two characters. One, a successful author of detective novels, the other a young man having an affair with the author’s wife. The premise of the play sees the author inviting the young man to his country home to learn his background and to make a criminal proposition. The author explains that his wife is used to expensive luxury and the young man is in no position to provide it. The author suggests that if the young man acts as a burglar and steals jewels kept in a safe in the country home it will benefit them both. The author can claim on the insurance and the young man can sell the jewellery. The author will enthusiastically call upon his experience of researching his detective novels to ensure the authorities are misled should any questions be asked. The stage is set and what follows is an engrossing battle of wits between the two men as layers of their characters (and character flaws) are unravelled and motives behind motives are revealed. I recently rediscovered Sleuth in its first movie adaptation which features a young Michael Caine and not-so-young Laurence Olivier in the roles of the two characters. Last night I enjoyed watching this play in its original form in the theatre. I find Sleuth fantastically enjoyable. Being a play there is a focus on characters, dialogue and interaction between the principal roles. This is reflected in the original screen adaptation with minimal deviation. Don’t expect any car-chases. The dialogue positively crackles with gleeful wit and self confidence – qualities that the character of the author believes he has no peer. As such the interplay between this older, successful man and the young upstart courting his wife is very much a game on one-upmanship. Nearly every line or response shows an effort to better the delivery of the other man. As the stakes increase and the balance of power shifts to and fro references to earlier exchanges are made in a different light and reveal greater depth. 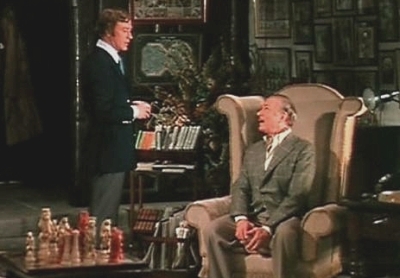 If you have any chance to watch Sleuth I encourage you to do so and can promise you as entertainingly sophisticated couple of hours as you’re ever likely to get. In all likelihood, it’ll be easier for people to see the 1972 movie than the theatrical version. I’m no theatre purist so see no harm in this. Watching this version will still reward you with a hugely enjoyable experience and a couple of Oscar nominated performances from two highly celebrated actors. Beware: I understand the 2007 version of Sleuth (featuring an older Caine in the role of the author) does not compare at all well to the other versions. So, before the deluge of summer blockbusters hits, hunt this down in one form or another and see it. I promise you won’t regret it. The last couple of weeks have been a difficult time for our family, in that on 27th October, my sister and brother-in-law’s niece, Maddie, lost her fight against a brain tumour. Maddie was only 10. Despite her symptoms and the side-effects of her treatment, Maddie was one of the most joyful people you would ever meet. I shall always remember her with a huge grin on her face, and the biggest belly laugh I have ever heard. Research into brain tumours in children receive very little central funding. Therefore, an event called the Million Metre Swim has been organised to help raise funds for Nottingham’s Children’s Brain Tumour Research Centre. You can read more about it at www.millionmetreswim.org.uk. Our niece, Hannah, who is also 10, has decided to help to raise money for the centre, so that, hopefully, other children can live. Hannah will be swimming 1 mile (64 lengths) on Sunday 11th November 2007 in Nottingham, as a participant in the Million Metre Swim. As I write, she has already raised more than £1200, but more money is needed to help research childhood brain tumours. Koffdrop has kindly agreed to promote Hannah’s fundraising by adding a link on this page to her website, which you can also visit at www.justgiving.com/hannahbignall. Since every penny counts, please consider donating. We are filled with admiration for the way in which Hannah and her brother, Liam, have remained brave and strong through this terrible time, and can think of no better tribute to their only cousin, Maddie. Finally, I would like to share with you a poem that Hannah and Liam wrote for Maddie, and which they read out at her funeral earlier this week. I’ve noticed a worrying trend with somes games reviews of late. There’s an increasing tendency for high-profile games to get perfect scores. I’ve seen ten-out-of-ten and 100% “Perfect!” reviews and it doesn’t make me happy. This is not to say the games being reviewed aren’t great. Just that they’re not perfect. No such thing exists. And to give a score that represents “free of flaws” or “couldn’t be improved” that a 10/10 suggests is simply wrong. No game is perfect. Every game can be improved. Every game has flaws. Now, in part, this is as much a criticism for using a two or three digit number to distill one person’s lengthy opinion of one game into a piece of meta-data that the typical A.D.D. style gamer can grasp as much as it is a critcism of misrepresenting “good” as “perfect”. I know what you’re thinking – and you’d be wrong. I’ve been against ‘perfect’ scores since the first time I saw Xenon 2 get 10/10 in Amiga Power. This isn’t an issue about games appearing on certain formats. Save that for the shallower arguments please. Although, I must say, in the two most recent examples of perfection that spring to mind, both are by western media, for western games, produced by western developers, parented by one of the largest and richest companies in the west. I’m not saying it’s a conspiracy but sometimes, when something sounds too good to be true it’s because the truth has been compromised. I know reviewers are human beings. They have feelings like you and I. They have bias like you and I, and they can get caught up with the excitment of the moment like you and I. The difference between us and them, however, is that most of us don’t use our opinion as the basis for our profession. So there is an expectation and a responsibility by reviewers to rise above bias, excitement and goodie-bag and remain objective. Anyone willing to review a product and declare it as perfect, in my mind, has compromised objectivity somewhere down the line. In fact, when I think about it, I dont think I agree with any game review that’s given a perfect score to it’s subject. I’d have considerable more respect for a review that stops at 99% than goes to 100. The last game I played to the end of was Bioshock. A game that got more than one perfect review. Ignoring hype and agenda-fuelled fanboys and, generally speaking, everything that wasn’t talking about the game itself, I wasn’t really too fussed about Bioshock. Once the reviews came through and the demo was played I had something meaningful to work with. As you may have read, I’ve bought the game, played through it and found it definitely less than perfect. This only serves to reinforce my attitude towards games with perfect scores. Of course, game scores carry a lot of the blame. At the end of the day they become numbers for warring fanboys to volley at one another to prove that something as unquantifiable as a player’s experience with a game can be represented by a number between 1 and 10 and, based on that number, serve as undeniable proof of the worth of a piece of silicon. Such a flawed mentality! I mean, if you truly gave a damn about whatever it was you were arguing about you’d manage to make the effort to say a little more about it than “average of 98%! !” to prove your point. But then, people are lazy and numbers, like stats and specs, are always manipulated to present a one-sided story. So, here’s hoping that games journalism can hold onto some shred of dignity by avoiding the easy, please-the-reader-at-the-expense-of-quality route and we can look forward to reading opinions worth something. In summary: if you think a game is perfect, or if you believe it should be graded with a perfect score then you’re happy to cheapen perfection when it suits you.